What makes the Moon change? Many of us throughout our lifetime have viewed the moon and its different shapes, but what is making the moon look so differently from night to night? Does the moon change size? Is the moon flat? If we were to only use our observations, that we have made from Earth, then these would be some of the common ideas that we might have. However, we know that the moon is a sphere. 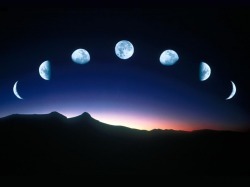 We also know, that the moon (sphere) does not ever physically change in size. So what makes it look as if someone took a big bite out of the moon? Where is the moon when we cannot see it? What is happening that directly impacts our perspective that we have on Earth? Examine and explore the websites below to generate your own ideas. Be sure to write down your own observations. *Do not forget to think about the perspective from which, you are viewing. Is your view from space? From Earth? Are you seeing a top view? A side view? Etc... Again, this is what makes these concepts so challenging.